SKU: StorMaxx-SE-119-2HX-EE. Category: StorMaxx SE Tanks. 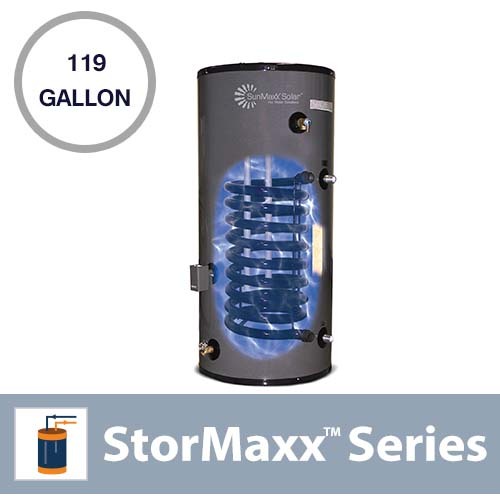 SunMaxx StorMaxx SE Solar Tank water heaters, offer a cost-effective water heating alternative. These tanks include a back-up electric element, which allows for the versatility of a stand alone solar water heater, or pipe it in as a pre-heat solar system. The StorMaxx SE is a durable porcelain enamel, glass-lined tank. Highly resistant to aggressive water. Not susceptible to damage due to the presence of chloride in the water. Built to last-inner tank is hand-crafted from heavy gauge steel. Longer life equals to higher return on investment. Outer jacket made from steel and powder coated for a lasting, durable finish.